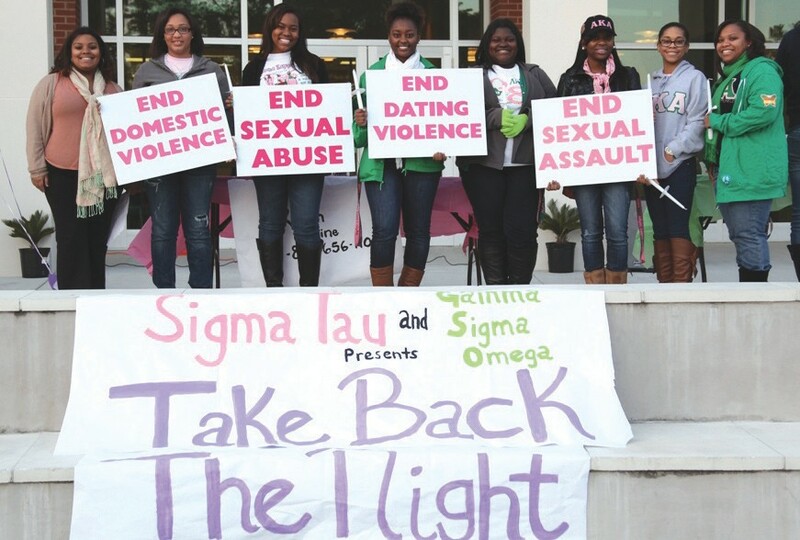 On March 7, 2013 at 6:00 p.m., members of Sigma Tau Chapter and Gamma Sigma Omega Chapter came together and participated in “Take Back the Night Walk”. The purpose of the walk was to raise awareness and fight to end sexual assault, domestic violence, dating violence, sexual abuse and all other forms of sexual violence. During the event, Alicia Fault of Sigma Tau Chapter shared her heartfelt story of abuse to the audience. Afterward, the participants walked around the campus of Armstrong with lighted candles, purple balloons and chanting phrases to end abuse. At the end, purple balloons were released in remembrance of those who were victims to any type of sexual abuse. This event was a great opportunity for members of Sigma Tau and Gamma Sigma Omega Chapters to bond on the campus of Armstrong Atlantic State University. There were 75+ people that participated in the walk. Among them were students, faculty and staff of AASU, Zeta Phi Beta Sorority, Alpha Sigma Tau Sorority, Army ROTC and the Collaboration Models. Overall, this was a great event to start Women History Month. Sigma Tau Chapter is under the guidance of Audrey Barnes Singleton, Graduate Advisor, and Sharon Stallings, Assistant Graduate Advisor. Patrese Jackson is the President and Erika Moultrie is the Ivy Leaf Reporter.